It’s that time of the year again… While you may be noticing the changes in the plant life, you might also be noticing some unpleasant changes in your four-legged friends. While your dog can be sensitive to allergens all year round, it is said that about 10 to 20 percent of dogs show signs of Spring time allergies. 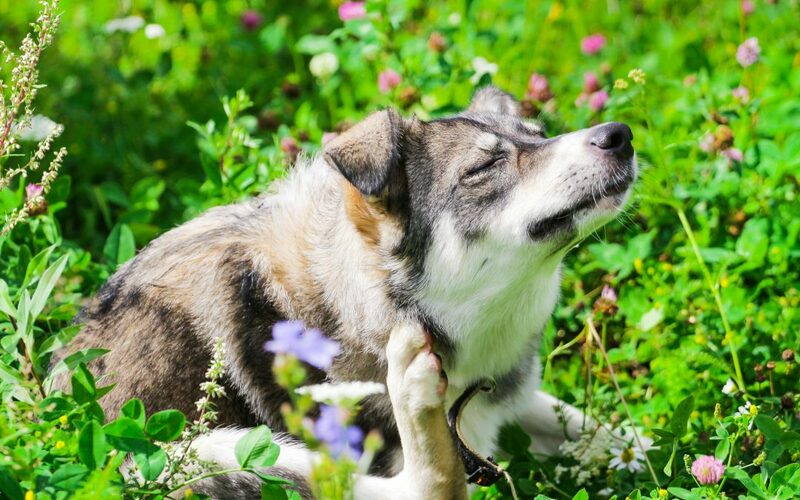 Just like humans, our dogs can be very sensitive to outdoor allergens. They include but are not limited to: trees, grass and weed pollens, dust, house and storage mites, fleas, and indoor and outdoor molds. Dog allergies can sometimes be very serious. There are a few different types of allergies, but we can categorize them into three distinct groups: food, external, and environmental. Since food allergies are relatively self explanatory (and will be saved for another post), we’ll focus mainly on external and environmental. These the two that tend to flare up the most during this time of the year. External allergies are commonly associated to fleas and flea bites. These which develop because the affected dog has a hypersensitivity to the flea’s saliva. Flea allergies range from moderate to severe, but the symptoms tend to be the same. They include: hair loss, redness, scabbing or hotspots (especially over the rump and base of tail), as well as coat odor and skin thickening. If you don’t notice the physical symptoms straight away, your dog’s behavior can be a key indicator as well. If you notice your dog excessively biting or licking themselves check your dog’s coat for fleas. Keep in mind fleas are incredibly hard to spot sometimes, especially on black dogs and dogs with an undercoat. (A flea comb, which can be picked up at your local pet store, can help you with this process.) If you still aren’t sure, take your dog to your vet and they’ll be able to do a thorough check for you. The best way to deal with fleas is to prevent your pup from getting them in the first place. (Fleas are incredibly difficult to deal with, especially once they’ve made their way into your house and begin living in your carpets.) Lucky for us, there are plenty of flea prevention and control products at your local pet store, and if you’re not too sure what’s best for your dog, ask your vet! However, if you do find yourself in the middle of a flea-tastrophe, products such as Capstar and Comfortis are fast acting oral capsules that are absorbed into the bloodstream and kill fleas fast. Environmental allergies are very similar to human allergies. Unlike humans, it is much more difficult to pinpoint the exact allergen that is causing your pet discomfort. Herbal medications like “Calendula Ointment” can relieve itch. Supplement your pup’s diet with flaxseed oil, which is said to reduce the effects of allergic reactions. Cleanse your pet’s ears with an ear solution such as “Zymoxch Ear Solution” which uses enzymes to combat antibiotic resistant microorganisms.